Our coastlines face numerous threats. Hurricanes, tsunamis, and sea level rise are a few of the dangers that keep coastal communities on edge. With over half of the U.S. population living near the coast, it’s critical to collect and share accurate information on the environment during extreme weather events. In four open coast areas along the Gulf, NOAA has deployed structures crucial to this effort. These are known as Sentinels. 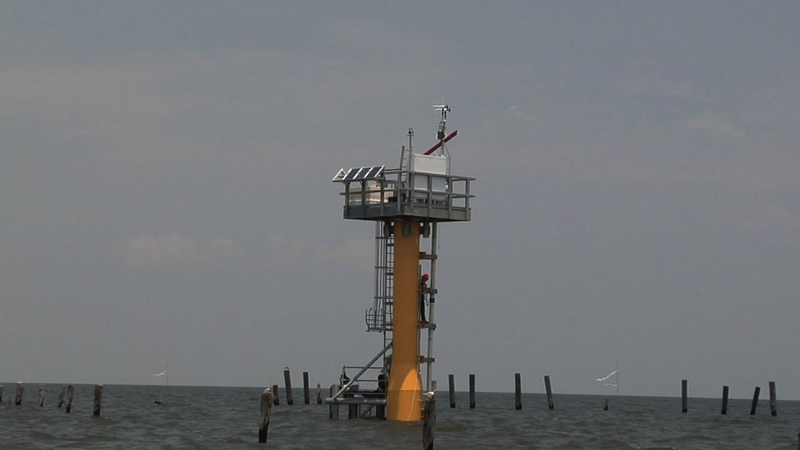 NOAA Sentinels are water level observing platforms that deliver storm tide data in real-time. NOAA designed these to withstand wind and wave action from a Category 4 hurricane. These elevated, sensor-packed stations are mounted on four-foot diameter steel pilings, which are driven 60 to 80 feet into the seafloor to ensure stability. As extreme weather hits, a Sentinel measures water level, wind speed and direction, air and water temperature, and barometric pressure. The data gets transmitted every six minutes by a GOES satellite to the Internet. This information is monitored 24 hours a day, 7 days week. Sentinels provide essential information to emergency responders and those forecasting marine weather, storm surge, and flood levels. Data from past storms can be used in engineering projects like levee construction and evacuation route planning. By standing guard over our shorelines, Sentinels help us protect people and property from the most wicked of weather. NOAA Sentinels are located off the coasts of Bay St. Louis, Mississippi; and Calcasieu Pass, Amerada Pass, and Shell Beach of Louisiana. Real-time data for all NOAA National Water Level Observation Network stations are available online at http://www.tidesandcurrents.noaa.gov.